"I think people come here primarily...to actually watch rugby and to enjoy the very best of New Zealand and that might include some alcohol -- a glass of wine or a couple of beers -- but it's not limited to that," Mr Key said about concerns of excessive drinking at the event. Most people would want to experience New Zealand's culture, food and scenery, he said. The Lions tour in 2005 was a good example of a well behaved rugby crowd. "They're an audience that's known for wanting to have a good time but they also behaved themselves impeccably." While the numbers would be larger for the Rugby World Cup the festival atmosphere would be the same, Mr Key said. The so-called "party central" to be hosted at Queens Wharf in Auckland would be a multipurpose space, he said. It would host events during the day, bands and fairs as well as having large television screens where people could watch games. 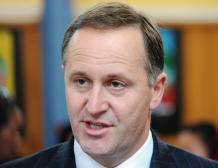 "Party central's never been just solely a place where people go and consume alcohol," Mr Key said. "It's a place where there's going to be quite a bit of celebration... that's one aspect of it but that's not its role in totality." The Rugby World Cup will be held in September and October next year.